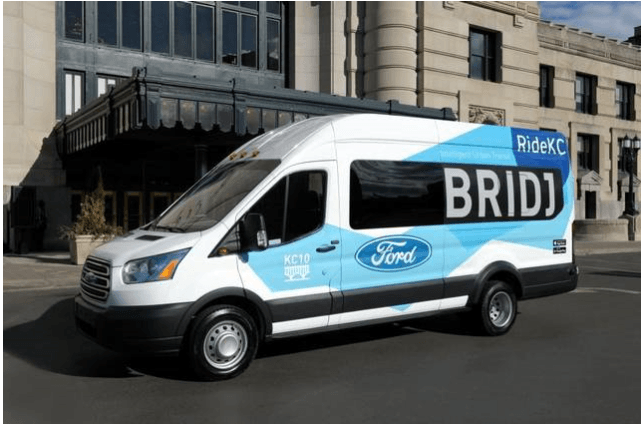 KCATA partnered with Ford Mobility Company and the private, dynamic shuttle service Bridj to launch an agency-run, zone-based dynamically routed shuttle. The pilot started with ten Ford Transit shuttle buses, with a 14-passenger capacity, picking up and dropping off passengers in limited areas of Kansas City MO and KS that are underserved or poorly connected by existing public transit. This partnership was the first of its kind, bringing together a major auto provider, a transit authority, and a private urban technology company to address transportation gaps in a city’s mass transit network. Bridj announced on April 30, 2017 that is was ceasing operations and would no longer be providing transportation services. While the Kansas City pilot had ended in March 2017, Bridj still served Boston with its shuttle service. For more information see the Boston Globe article, “Toyota pullout left Bridj out of gas”. Additional information on the Kansas City partnership can be found on KCATA’swebsite.